My Times Are In Your Hand …. O my Father, another month is coming to an end. I continue to observe the emptiness or devoid of value of so many public information gates in the Internet. And I wonder about the people that publishes such deplorable information? In this golden silence at the moment…. I lift up my being in worship unto You, Almighty Loving Father/Creator/Redeemer of my soul! In silence, I worship You! My times & all there in encompassed are in Your loving hands; I have nothing to fret about! How blessed I am! Who am I that You are mindful of me? In You, O my Master Yahuwah/Yahushua—my Beloved, I have taken refuge; Let me never be ashamed; Deliver me in Your righteousness. Incline Your ear to me, Deliver me speedily; Be a rock of refuge to me, A house of defense to save me. For You are my rock and my stronghold; For Your Name’s sake lead me and guide me. Bring me out of the net which they have hidden for me, For You are my stronghold. Into Your hand I commit my spirit; You have redeemed me, O my Master Yahuwah/Yahushua—my Beloved Yah of truth. I have hated those who observe lying vanities; But I trust in my Master Yahuwah/ Yahushua—my Beloved. I exult and rejoice in Your kindness, For You have seen my affliction; You have known the distresses of my life, And You have NOT shut me up into the hand of the enemy. You have set my feet in a large place. Show me favour, O my Master Yahuwah/ Yahushua—my Beloved, for I am in distress; My eye, my being and my body have become old with grief! For my life is consumed in sorrow, And my years in sighing; My strength fails because of my crookedness, And my bones have become old. I am a reproach among all my adversaries, But most of all among my neighbours, And a dread to my friends; Those who see me outside flee from me. I have been forgotten like someone dead from the heart; I have been like a missing vessel. 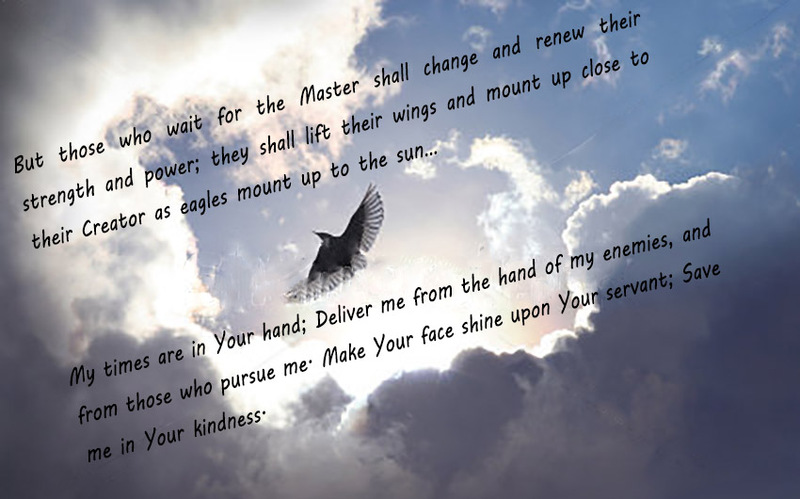 My times are in Your hand; Deliver me from the hand of my enemies, And from those who pursue me. Make Your face shine upon Your servant; Save me in Your kindness. Do not let me be ashamed, O my Master Yahuwah/Yahushua—my Beloved, for I have called upon You; Let the wrong be ashamed; Let them be silenced in the grave. Let lips of falsehood be stilled, Which speak recklessly against the righteous, with pride and scorn. How great is Your goodness, Which You have laid up for those fearing You, Which You have prepared for those taking refuge in You In the sight of the sons of men! In the secrecy of Your Presence You shall hide them from the plots of man; You shelter them in a booth from the strife of tongues. Blessed be my Master Yahuwah/Yahushua—my Beloved, For He has made marvelous His kindness to me in a strong city! And I, I have said in my haste, “I am cut off from before Your eyes,” Yet You heard the voice of my prayers When I cried out to You. Love my Master Yahuwah/Yahushua—my Beloved, all you His kind ones! For my Master Yahuwah/Yahushua—my Beloved guards the trustworthy ones, and exceedingly repays the doer of pride. Be strong, and let Him strengthen your heart, All you who are waiting for my Master Yahuwah/ Yahushua—my Beloved! O my Master Yahuwah/Yahushua—my Beloved how real Your Presence is within and without all around me! In the stillness of this moment I worship You! For You are worthy of praise and esteem and honor now and forever! HalleluYah! Well, my Father, I done run out of things to do that I felt inclined of doing! As much as there are many things that I could be doing, You know my Father that I don’t have the get up & go for anything else at the moment! Not even sleep entices me at the moment! Father, You know how hard it is to come down to the reality that one has been out of packet for days sometimes and no one bothers to check if you are dead or alive? It surely is getting to me, my Father and You know it! For the most I am content with my solicitude, but, after all You did not make us to live alone, or, did You? Then, finally I got on to do different things and eventually I went to sleep! Blessed sleep! HalleluYah! But then I woke up wondering why I dreamed that somebody was chasing me with a knife on hand to kill me and get my tomatoes! I can still see my tomatoes…O my Father, but You know all of this. I did this & that and finally it came to me to check my emails? WOW! What is it that I found? I don’t know to the fullest yet, but I will find out as Father develops things for me! Even so, in exploring this site I find myself totally helpless to keep myself afloat of this wave of positiveness! Good, beautiful, wonderful? Indeed! The whole thing of ‘Wellness’ is like a magnet to catch the attention of a suffering world! YET! Not all that shines is gold! I must remember that! Father? Is this Your way of telling me that I must engage with the bloggers You send my way? Is this Your way of telling me that You did not make us to live alone? Thanks my Father! I catch Your drift! I will post this reply on the double! I know that whatever You develop between my joyful sister & myself shall all be for our eternal good! Ha! Ha! HalleluYah!